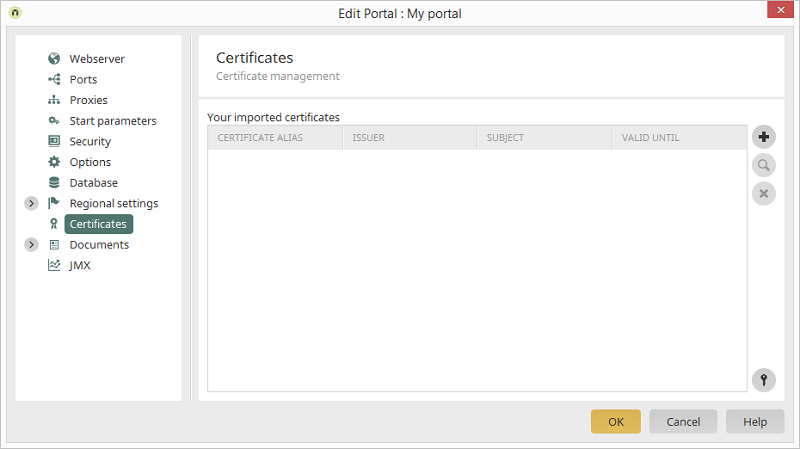 You can configure the certificate store of the portal server here. If certificates are required, e.g. for accessing web services, LDAP servers, RSS feeds or OData services, then they are retrieved from this store. Opens a dialog where the password for the certificate store can be entered (this is required once per session). The name of the certificate is shown here. Displays the issuer of the certificate. Displays who the issue was created for. Displays when the certificate's validity expires. Opens a dialog where a certificate can be imported. To finalize the import of a new certificate or to prevent a deleted certificate from being used, you need to restart the portal server. Opens a dialog where the password for accessing the certificate store can be modified.